The results of new research into every significant injury suffered by every Premier League footballer in the 2011-12 season reveal that Manchester City came out as clear winners in the injury league – suffering fewer major problems than any other side. The data has been compiled by analysts at www.physioroom.com and will be published shortly although key findings have been made available to Sportingintelligence. The PhysioRoom team logged every injury to every player throughout the season, and for the purposes of the headline data, considered a ‘significant’ injury to be one where a player was unavailable for competitive matches for at least 14 days as a result of that specific injury. 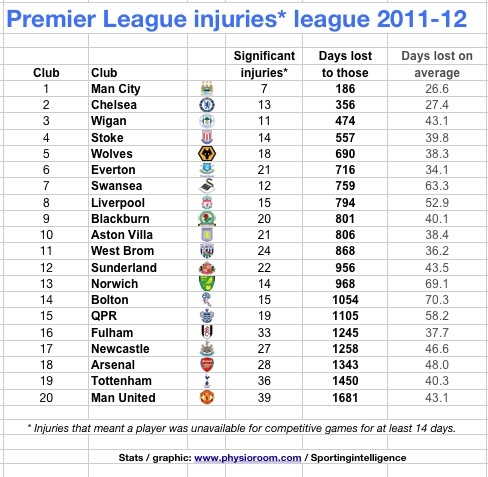 As our league table below shows, City suffered the least number of significant injury episodes (seven), with the players involved in those missing the fewest number of combined days to injuries during the season (186 days). The single most significant injury for City was Nigel De Jong’s ankle problem. That kept him out for 39 days in August and September. City’s six other significant injuries involved Sergio Aguero (twice, groin in October, then foot in March-April), Aleksandar Kolarov (groin November to January), Vincent Kompany (calf, March), Joleon Lescott (groin, March-April) and Pablo Zabaleta (thigh, March). NB: Owen Hargreaves had no single injury that kept him out for as long as two weeks. Rather he had a series of ‘small niggles’ that limited his first-team appearances, the researchers say, and he was in fact playing regular reserve team football. Conversely, Manchester United’s season was blighted by an exhaustive injury list including a ruptured cruciate ligament to captain Nemanja Vidic in December. The Old Trafford club suffered more significant injuries than any other clubs (an astonishing 39 of them), losing the players involved for a combined total of 1,681 days. Michael Owen was the player missing the single longest spell for one single injury: 193 days for a thigh problem between November and May, although three other players also had a least one injury sidelining them for more than 100 days: Vidic’s ligament damage kept him out for 158 days, Darren Fletcher’s bowel illness means he missed 152 days and Tom Cleverley’s ankle problem kept him out for 102 days. The following United players each had one or more ‘significant’ injuries that kept them out for at least 14 days each time: Anderson, Berbatov, Cleverley, De Laet, Evans, Fabio, Ferdinand, Fletcher, Gibson, Giggs, Hernandez, Jones, Lindegaard, Macheda, Nani, Owen, Rafael, Rooney, Smalling, Valencia, Vidic, Welbeck, Young. With such an extensive catalogue of injury problems, United fans might reasonably argue that their season – which ended in title defeat on goal difference to City – hinged on this woeful string of injury problems. United’s second-best defensive record in the Premier League in 2011-12 looks more astonishing still when considering the key players lost at various times, not least their captain, Vidic, to his ACL injury back in December. A revolving backline was switched match after match as defenders kept being taken out of action by a series of problems. They included Phil Jones (facial, ankle, illness), Chris Smalling (head, knock, tonsillitis, groin that keeps him out of Euro 2012), Lindegaard (ankle), Ferdinand (back, groin and ankle problems) and Evans (ankle and calf). PhysioRoom (who can be followed for injury updates on Twitter here) will be keeping tabs on all the national teams competing at Euro 2012. A spokesman, Stuart Mills, says they have assessed the chances of injuries among Roy Hodgson’s England squad and found most of the players at low risk of injury, given their seasons. But PhysioRoom data shows Glen Johnson as having a “low to medium” chance of injury given his record, with the same risk rating applicable for Phil Jones, Wayne Rooney and Danny Wellbeck. Steven Gerrard and Scott Parker are rated “medium to high” risk. Mills told Sportingintelligence: “Steven Gerrard was used sparingly by Liverpool and struggled in the second half of the season with a few ‘minor’ injuries. I wouldn’t be surprised if there was some underlying condition or problem. The other major issue for England will be fatigue due to the number of games played during the season. The Chelsea players in particular will be the major concern following their exploits, as they achieved double glory in the Champions League and FA Cup. While there are apparently no major injury concerns around Chelsea’s John Terry, Frank Lampard, Ashley Cole, Cary Cahill and striker Daniel Sturridge, who is on the standby list , there will be questions marks relating to fatigue. On the plus side – from an England point of view at least – the two Manchester teams and Arsenal were knocked out of the Champions League and FA Cup relatively early, so a significant number of the squad including Rooney, Joe Hart and Theo Walcott played less games towards the end of the season than they may have expected. “Some key players have played less in the run-in, but the Premier League was competitive until the end and so some players such as Rooney and Scott Parker, who may have been rested in ‘dead rubber games’ if carrying an injury, had to soldier on”, added Mills. The 2011-12 Premier League season findings pinpointed hamstring injuries as the most common (46.5 per cent of all injuries). Injury-prone QPR midfielder Kieron Dyer was the player out for the longest times. The former England international, 33, broke his foot several minutes into QPR’s opening-day defeat by Bolton and has yet to return. Despite missing 274 days, Dyer has received a one-year contract extension to remain at Loftus Road.